PORTLAND, Ore. – (Jan. 18, 2018) – The design of Freightliner Trucks’ new Cascadia® model was selected for a recent 2017 GOOD DESIGN™ award. The prestigious competition selects product designs and graphics from more than 46 nations for design excellence. Founded in Chicago in 1950 and curated by the Chicago Athenaeum: Museum of Architecture and Design and The European Centre for Architecture Art Design and Urban Studies, GOOD DESIGN is one of the oldest and most recognized programs for design excellence globally. Submissions are received from Fortune 500 companies and design firms. By combining innovative technology with ergonomic design, the new Cascadia’s interior includes advancements in comfort, flexibility and safety. 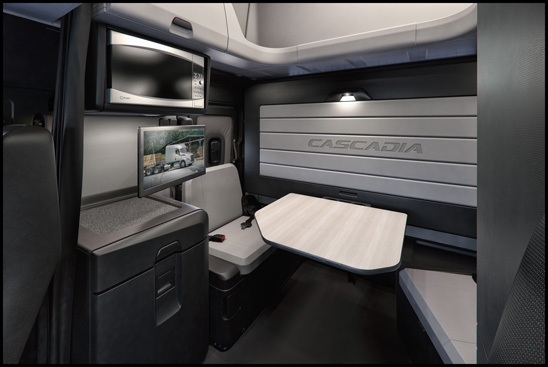 The new Cascadia’s interior space configurations let drivers customize their living space to best suit their needs. The sleeper area offers dimmable ambient LED lighting that can illuminate the interior to near daylight levels. The space also has more cabinets, as well as larger areas to accommodate standard appliances and a sturdy, flat-panel TV swivel bracket that can hold up to a 26” screen television. Options for a double bunk or a Driver’s Loft are also available. The Driver’s Loft includes a dinette/work table and opposing seating with seat belts, which can be quickly folded to allow for a full-size, drop-down, murphy-style bed with the double bunk option. 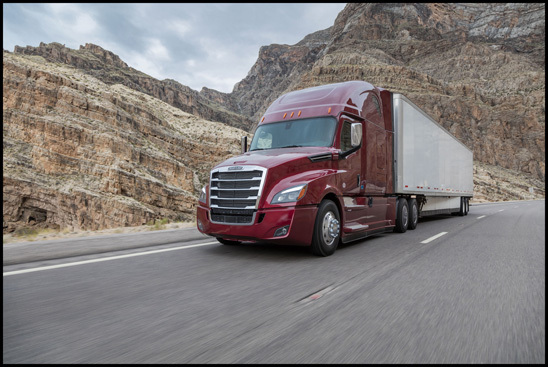 The exterior styling of the new Cascadia focuses on sleek aerodynamic features, offering Aero or AeroX exterior packages to maximize fuel efficiency. The one-pane windshield and sloped hood offer superior visibility and the elliptical-shaped mirrors also contribute to fuel efficiency. “We’re proud that the new Cascadia has been recognized with the GOOD DESIGN award, and we’re even more proud of the achievements found in the new Cascadia that benefit drivers while they’re both on the job and off,” noted Kelly Gedert, director of product marketing for Freightliner Trucks and Detroit Components. For more information about the new Freightliner Cascadia, please visit www.freightliner.com.